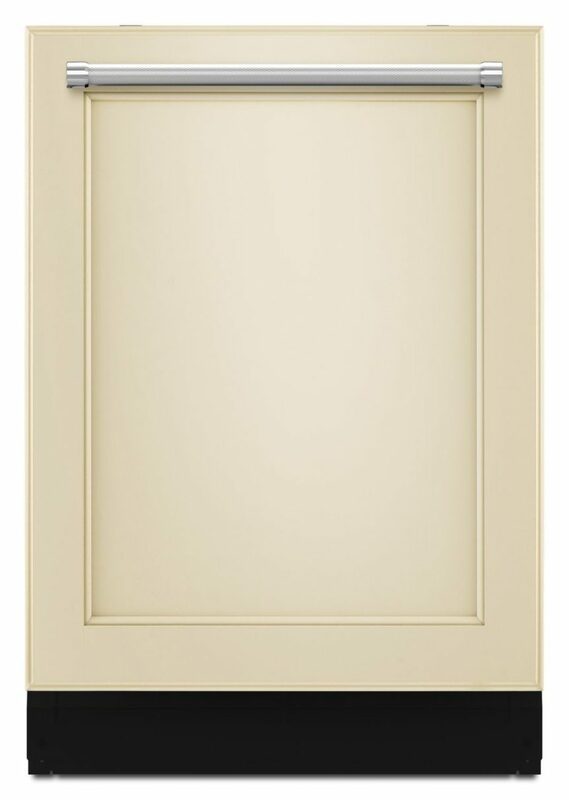 Decorative panels can make your dishwasher fit seamlessly with your kitchen’s style. If you want your kitchen to have that custom feel, you can add the paneling yourself to matching KitchenAid models. This is only available for specific model numbers. Order a custom panel kit (for model #KDTE204EPA) and follow these steps to install it. 1. Partially uninstall the dishwasher. If you’re adding the panel to a new dishwasher, skip this step. If you’re working with a currently installed dishwasher, turn off the water connection and detach the supply line. Also unplug the power cord. While you don’t have to fully uninstall the dishwasher, you do need to move it forward a few inches. Unplug it for safety and detach the water line so it doesn’t get tugged on. Next, unscrew the support brackets holding the dishwasher to the underside of the countertop. Open the door to a forty-five-degree angle and grab the sides of the machine. Carefully rock it from side to side to pull it forward an inch or two. Then close the door. First, position the handle along the seam of the decorative paneling or approximately three inches from the top of the panel. Make sure the handle is centered and mark its position. Next, drill the left and right holes for the screws. Drill through both sides to remove any splinters so the screws can be flush with the panel. Drive the screws through the front or back of the panel according to the handle’s design. Then attach the handle and fully secure it with the screws. 3. Prepare the panel and door for installation. First, turn the panel over and tape the provided template on the back of the panel. Make it flush with the top edge rather than the bottom.Add four pilot holes and drill them 5/8″ deep. Next, screw in the plastic studs and metal screws to hold them in place.Orient the double-sided tape with the keyholes in the door of the dishwasher. Check the positioning before you remove the wax backing. Once you confirm everything aligns, remove the backing on each piece and stick it onto the door. This provides cushioning between the panel and the metal. Next, slide the four studs on the back of the panel into the tops of the keyholes and carefully lower the panel into position. Push it down until the top of the panel aligns with the top of the door. Once you’re certain the panel is positioned appropriately, you can add the final screws that will hold it in place. To do this, open the door. Remove the screws in the top corners and the screws second from the bottom on the left and right side. Drill into the screw holes through the dishwasher door and into the panel. Consult your specific manual for the exact depth you should drill before you start. Then insert the same depth screw into each elongated hole. The screws will grab onto the door and panel to hold it in place. Whether you’re adding the panel to your current dishwasher or this is a new appliance, the steps are the same. Feed the water supply lines and the power cord through the hole in the side of your cabinet and into the cabinet under the sink. Push the dishwasher partially under the countertop and pull more of the supply lines and cord lengths under the cabinet. Then slide the appliance fully into place. Next, open the door and tighten the screws into the underside of the countertop to secure the dishwasher in place against the counter. Go to the cabinet under the sink. Reattach the water supply line. Also reclamp the drain line to the garbage disposal. Then plug in the power cord.If you want to do more DIY appliance repair, go to Appliance Tec for more resources. We also have appliance repair technicians standing by.